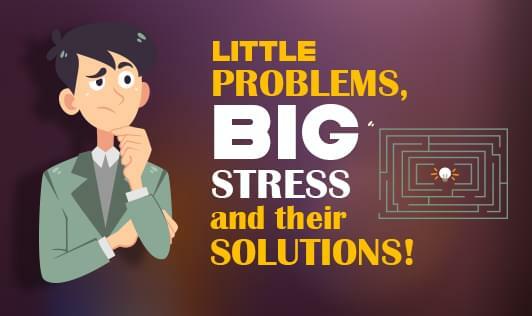 Little problems, big stress and their solutions! For some people, the greatest toll from stress may come not from the loss of a job, divorce or other major traumatic events, but from the minor yet frequent annoyances they experience daily—getting stuck in traffic, having an argument at work, noise from a neighbor. Hassles are largely subjective. What one person experiences as a hassle may be a non-event for another person—or a major crisis. The good news is that while hassles are unavoidable in daily life, we can often do something about our reactions to them and thus the effect they may have on our health. The key to lessening the burden of daily hassles is to strengthen coping mechanisms. Own your stress! – Take control over your stress, it isn’t uncontrollable. Change your reaction- See your reaction, if you are catastrophizing then change that. Anger management- Learn some simple anger management techniques, even drinking a glass of water helps! Relaxation techniques such as meditation and exercise- Meditation and exercise help in relieving the good chemicals in your brain which ultimately leads you to feel happy. Don’t multitask- It reduces your efficiency and increases your work! Indulge in a Hobby- This helps you in finding some time for yourself.